On the evening of December 20, 1968 my parents were married in a Christmas service. 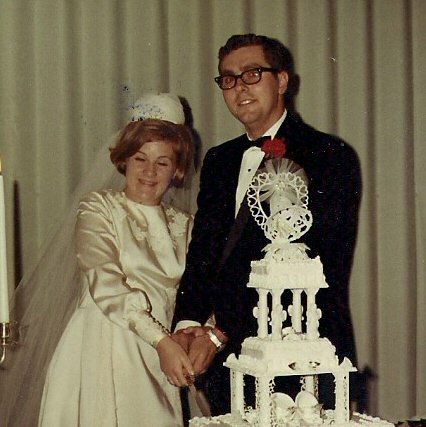 My parents at their wedding reception on December 20, 1968. 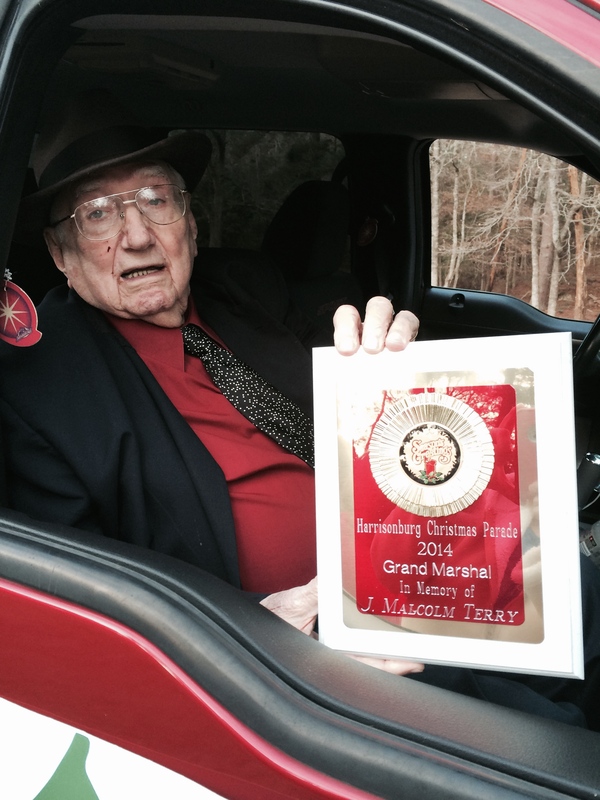 Forty-six years later, on the evening of another December 20th, my family represented my father as Grand Marshal in the Christmas Parade. What an honor that the town where my dad grew up and lived out his adult years chose to remember him and his influence in this way. 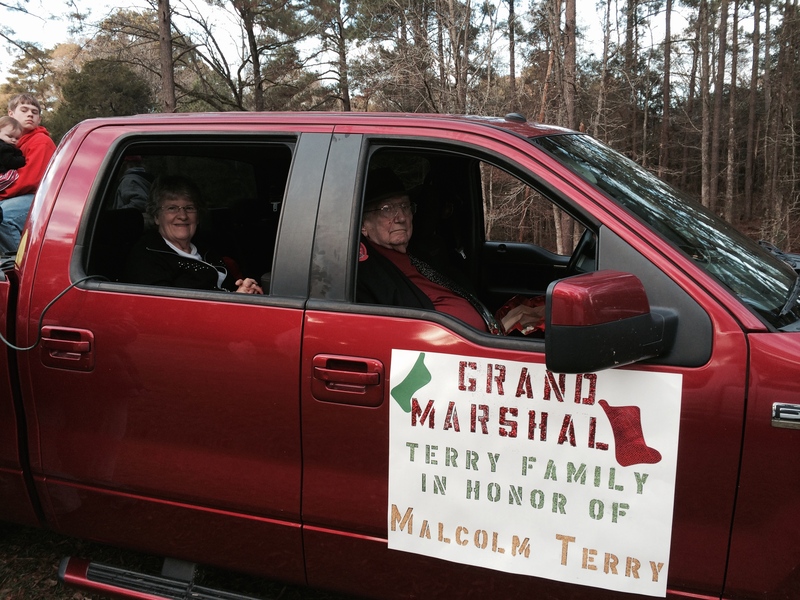 The year the Terry family will ride as Grand Marshal of the parade as representatives of our beloved Malcolm Terry (1947-2014). Malcolm was a valued member of our village and a friend to all who knew him. He worked willingly with this community, serving as a teacher, principal and deacon in his church. It was his love of community and willingness to serve that pushed him to help organize and serve as president of the newly founded Village of Harrisonburg Service League. Malcolm also served his country in Viet Nam. He was a beloved husband, father and doting grandfather. We are honored to welcome his family as they ride as Grand Marshal in his memory. When my mother first called to tell me about us riding in the parade as Grand Marshal, I felt honored … but worried as to how we would ever manage to pull this off. It’s not as if my brother, sister or I still live in our hometown of Harrisonburg. And while this isn’t the Rose Bowl Parade, I still wanted to be pleased with whatever float we managed to make. 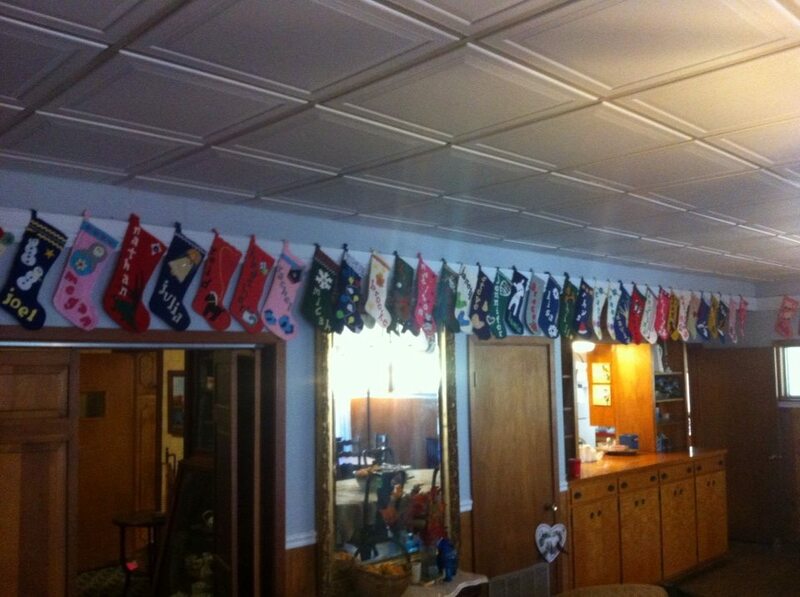 The above photo shows a part of the giant wall of stockings at the Terry house. In fact, the line of stockings goes the entire length of one wall, turns the corner and fills almost a complete second wall! Seventy stockings takes up a lot of room! I’m sure my grandfather is grateful that no one expects him to fill each one with goodies. 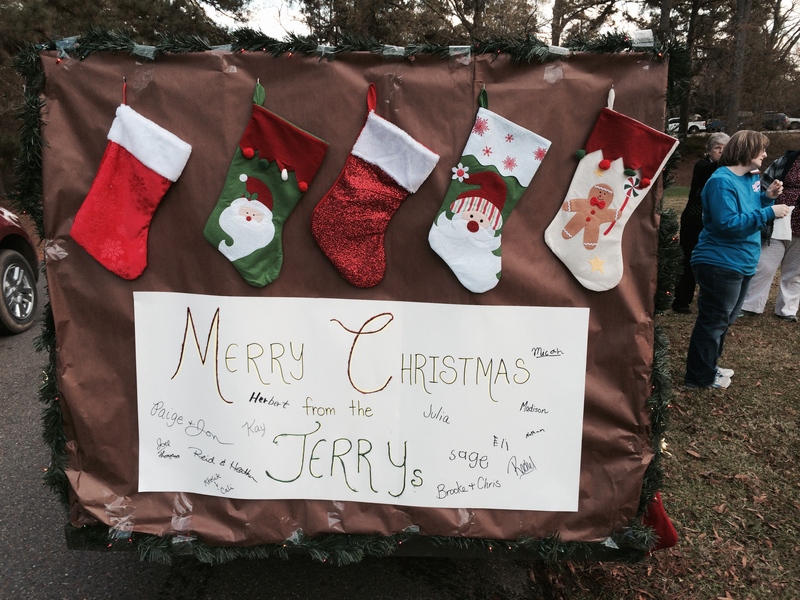 As a tribute to this long-standing Terry family tradition, we lined our float with stockings as well. We also put on lots of colored lights and gold garland. 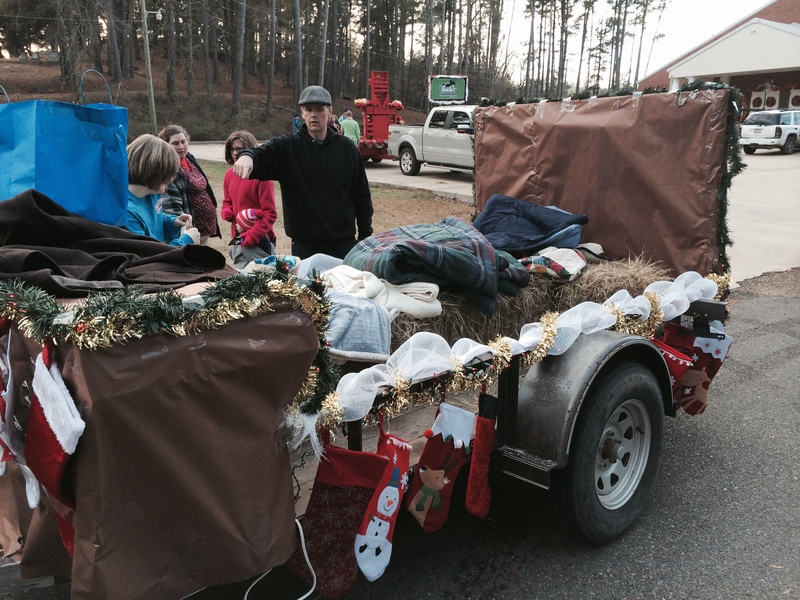 The back end of the trailer (and all around the sides) lined with stockings as a tribute to our family tradition. Speaking of candy, we put our kids on the back of that float and gave them bags upon bags of candy to throw at the waiting crowd. I wish I knew exactly how many pounds of candy we gave them, but it was a lot! To put it another way, my mother filled the back end of her car with the candy to take to the parade line-up and not a single other person could ride with her. Once the parade got started, those kids threw candy! Some threw it by the large handfuls, requiring a stern reminder not to pelt the onlookers. Others threw it a piece at a time. Some, like my five year old niece Sage, decided to not throw very much candy at all. That smart girl was banking on the hope that whatever amount of candy she had left at the end of the parade would be hers to keep! 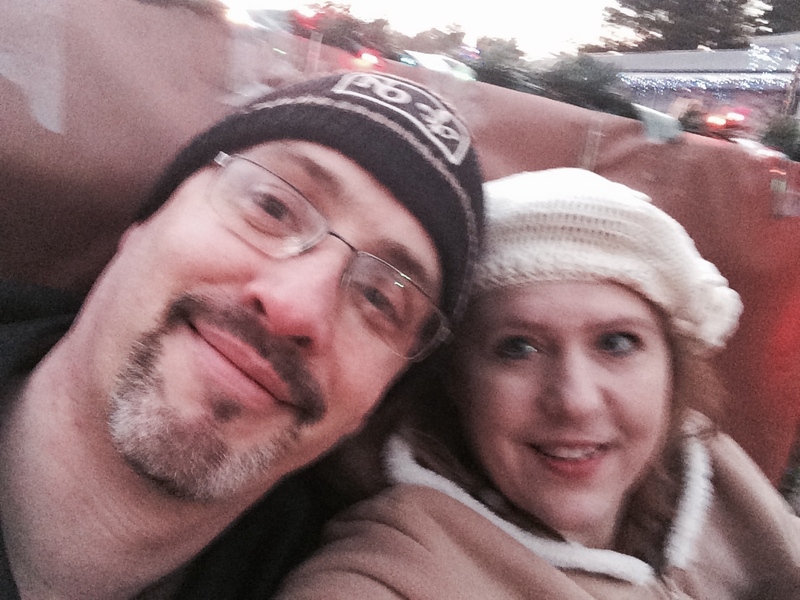 It was a little chilly that evening. My sister-in-law Heather saved the day (or rather our fingers) by giving us all tiny hand warmers to tuck away inside our gloves. 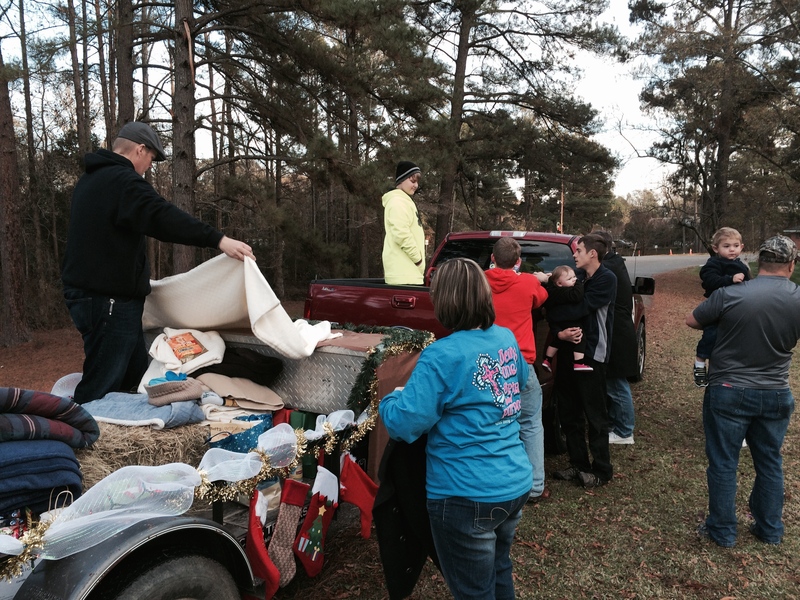 My mother did her part as well, pulling out all of her quilts and blankets so that all of those sitting on the float we were bundled up and toasty. Reid and Heather getting the blankets sorted out so that everyone was warm. 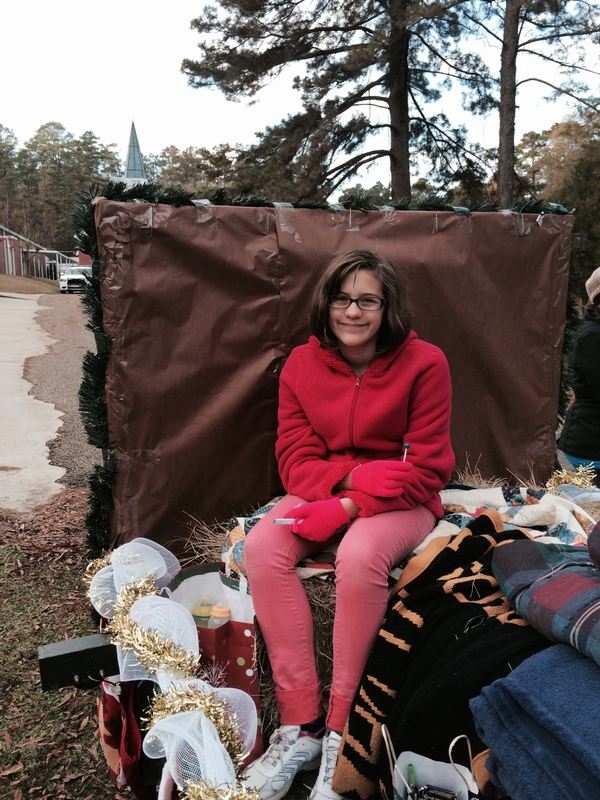 Julia was the first one on the float … maybe because she was cold. Not everyone got to sit on the back of the float. 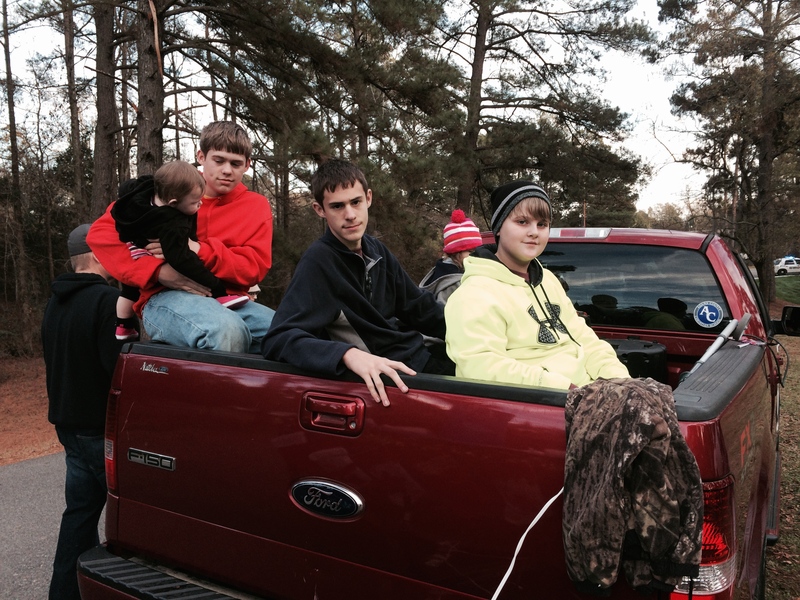 The three big boys (my sons Joel and Nathan, and my nephew Micah) took over the back end of the truck. My mother and my grandfather sat in the cab of the truck, along with my sister Brooke (who is 8 months pregnant) and her husband Chris (who volunteered to drive us). Mom and Papaw seated inside the warm truck. Not only was the experience a lot of fun, it helped us all smile on what could have been a very difficult day. The town we loved showed their affection for us as a group, as well as their love for my dad. It was certainly a comfort to be remembered in such a meaningful way. Papaw with the plaque given to us as a memento of the event. My father was always proud to call Harrisonburg, Louisiana home. He genuinely loved the people and I don’t think ever desired to live anywhere else on earth. And even though I love that tiny town as well, my love in my heart for the people there grew significantly as I rode through the streets in the Christmas Parade … and I’m proud to say that I’m from Harrisonburg too. More than that, I’m proud to say that I am Malcolm Terry’s daughter. Jon and I enjoying the experience. Great and meaningful story…miss knowing he’s in Harrisonburg! Me, too, Catherine … me too. In fact, most days, I still have to remind myself that my father has passed away. Far too often, I pick up the phone to tell him about some crazy thing one of the kids did or said. Thank you … it was a very sweet evening. What a wonderful way to honor your father… loved this! This is super!!! Loved it!!! Thank you, Levi! I’m so glad I was able to go and be a part of that, sharing in the experience with my mother, siblings and nieces/nephews. I was born on a cotton farm north of Harrisonburg in 1942 but have no memory of living there. I stumbled on your blog looking for something about Harrisonburg. Fun reading. My grandparents lived there many years… Dan and Tori Alexander. Still have wonderful relatives there. I never met a Harrisonburg citizen that I didn’t like. Hi Patsy! I know some Alexanders from Harrisonburg … I am guessing it’s the same group as your relatives. Harrisonburg is a wonderful little community. Sometimes I wish I still lived there. I’m in Lafayette now, but Harrisonburg will always be home. Thanks for stopping by my blog!